As you may have heard this morning, Christoph Lindner, dean of the College of Design, has accepted a position as dean of the Bartlett Faculty of the Built Environment at University College London. He will remain at the University of Oregon through August. I am grateful for all Christoph has done during his time as dean of the College of Design, including his leadership in transforming the School of Architecture and Allied Arts into the College of Design, which comprises the School of Architecture & Environment, the School of Art + Design, and the School of Planning, Public Policy and Management. There will no doubt be questions about the process for filling the permanent dean position. My office will coordinate this effort and I will provide more information soon. Please rest assured knowing that the search will follow standard practices, including a review of the position profile, putting together a diverse hiring committee, and hosting public presentations and interview opportunities for finalists. I am writing to share with you that I have accepted the position of Dean of The Bartlett Faculty of the Built Environment at University College London beginning Fall 2019. It has been an honor to serve as Dean of the College of Design for the past three years. I would like to take this opportunity to thank all of you for your work in making the college what it is today. I am especially grateful to our talented faculty and staff, who are a vital source of the college’s success. My thanks as well to our school heads, department heads, and associate deans for their dedication in leading the College of Design, as well as our Dean’s Advancement Council for their ever-present advocacy, advice, and enthusiasm. I look forward to finishing the academic year with you, and continuing to work with everyone to advance our academic priorities. 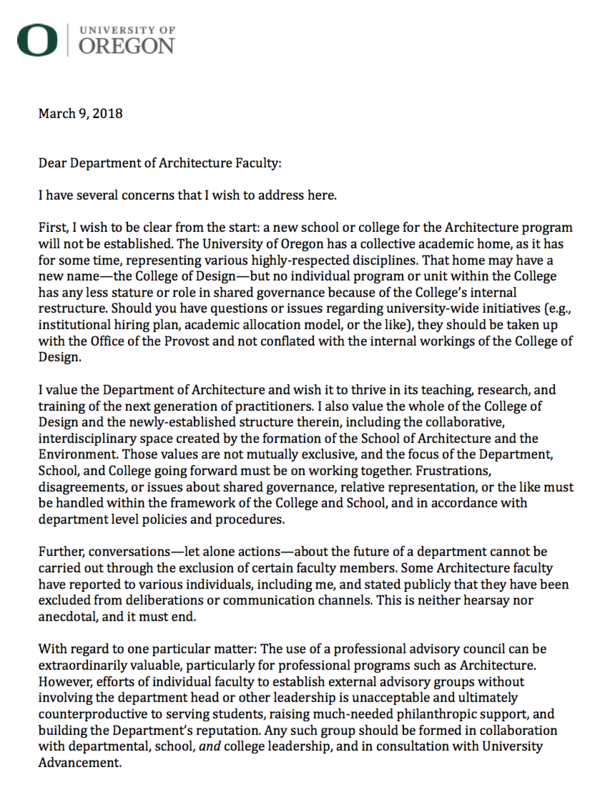 During the coming months, I will also be working closely with the Office of the Provost to ensure that the many important programmatic and hiring initiatives in the School of Architecture & Environment, School of Art + Design, School of Planning, Public Policy and Management, and the Department of the History of Art and Architecture continue to move forward smoothly during the leadership transition. The provost will be sharing more about that transition plan shortly. There has been some discussion recently in our College regarding shared governance and the faculty’s right to gather and discuss difficult and often controversial subjects with respect to the direction of a particular department or program. Given those discussions, I want to take this opportunity to reiterate my strong commitment to shared governance principles, including the right of faculty to gather and discuss affairs without repercussion, retaliation, or interference by the administration. In our unionized environment, those principles often overlap with the legal right of the union and its members to discuss union issues in a similar environment. I know my commitment to these principles has been questioned recently due to a member of staff inadvertently attending a closed faculty meeting and taking a picture. While I can assure you that those actions were not taken at my direction and were based on a misunderstanding that the meeting was an open town hall, I understand that this person’s actions may have been intimidating and caused some faculty to feel uncomfortable discussing important issues freely. For that, I apologize. Since that incident, I have met with my staff and reiterated that attending union meetings, or taking actions that may interfere with a faculty member’s ability to participate in protected union or shared governance activities, is not permitted. As we continue to build our new College of Design, I look forward to working together to create a positive and healthy work environment. The event was pretty well attended, with about 30 CoD faculty and 5 or so union reps. There was a full and frank discussion that went on til 5:30, and continued in small groups afterwards. I helped bring in extra chairs, one of which was then taken by a gentleman who unobtrusively started taking cell phone pictures. A union rep saw this and asked him to leave, which he did. He came back a few minutes later, and since I was lounging by the door he asked me why he’d been asked to leave and what the rules were for union meetings. Full disclosure: I have no idea. So I told him that people wanted to have an open discussion and he was making them nervous since they didn’t know who he was. I asked him who he was. He said he was the director of development for design. I asked him why he was there. He said because he was worried about what they were talking about and wanted to know what was going on. I asked him why he was taking pictures. He said because he didn’t know many faculty by name and wanted to know who was there. Sorry for the long post. Those who know the history should cut to the bottom for the new letter from the faculty. 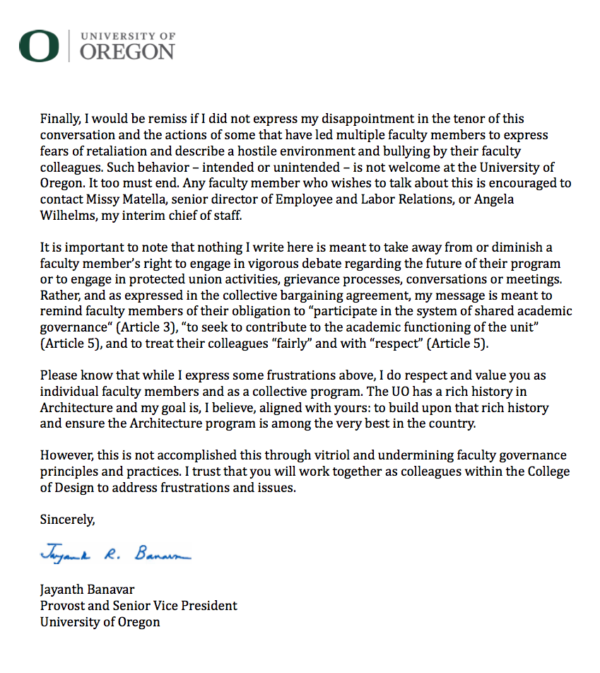 The UO administration has a long history of making vague charges of bullying, harassment, and “incivility” against faculty who complain about administrative misfeasance and malfeasance, or otherwise question their leaders. 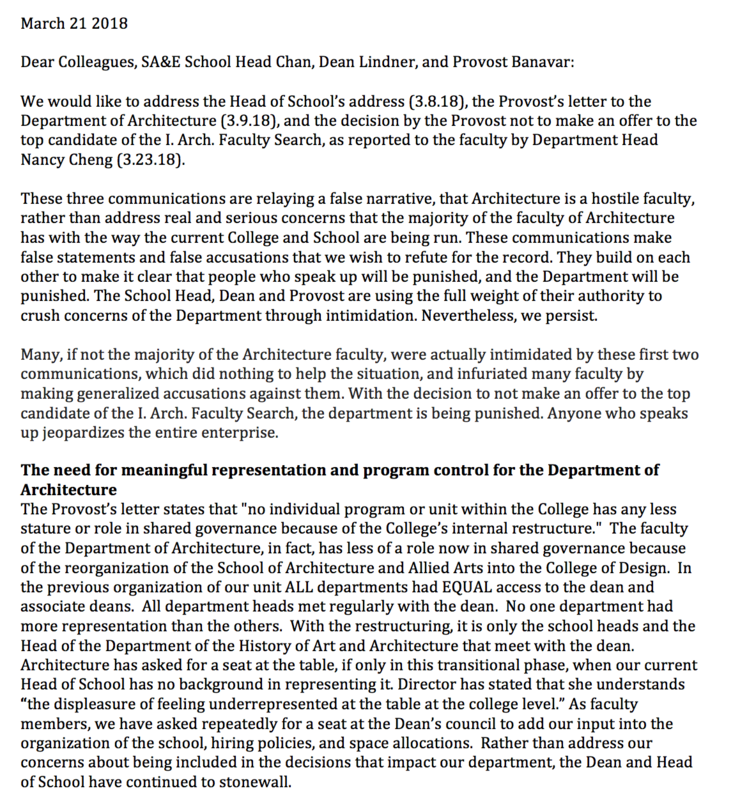 They are trying it again on the Department of Architecture faculty. Those faculty are fighting back. – initially this School of Architecture should include three departments: Architecture, Interior Architecture, and Historic Preservation. One marvels at the level of incompetence it must take for a dean to let things deteriorate to the point where the faculty would find it necessary to organize such a meeting and then vote 2 to 1 against his leadership. Intentionally or not, this movement threatens our school, and impacts every one of us in it. To summarize my assessment of it I will say this: It is harming our reputation within the University. It is stalling some of, and impacts all of, the progress we are making. It is taking emotional energy away from building this place and putting energy into tearing it down. Moreover, some individuals in the department of Architecture (this includes some NTTF, some TTF, junior faculty, and leaders) have been excluded from these discussions—discussions that aspire to abolish the very School in which these individuals work! I further object to the tone of this movement. I honestly do not see how any concerns are going to be resolved with the independence movement or under the divisive tone it sets. The brinksmanship it creates, whether intentional or not, creates a climate of fear. 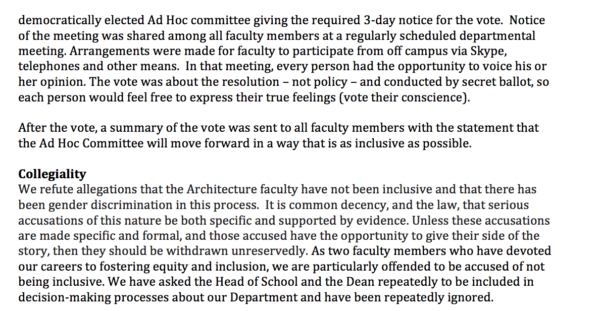 I have heard accounts of, and seen first-hand, that faculty members in architecture feel intimidated and silenced either through exclusion and/or hostility. I am talking about eye-rolling and other gestures of dismissal in faculty meetings, communications that imply that someone who isn’t with the movement “lacks courage”…snide comments behind people’s back –I’ve seen colleagues attempt to undermine other faculty members who stick their necks out and ask for clarity, explanation, and a voice for the less dominant voices in the room. I’ve seen gender discrimination. Let me be clear: the hostile work environment in Architecture is totally unacceptable. This kind of behavior has NO PLACE HERE. In my role as a faculty member in the department of landscape architecture for the past 17 years, I have been consistently treated with respect, trust, kindness and compassion. This is true even when I make mistakes, go against the grain, or disagree with my colleagues. Yet in my short time in this role I have seen some faculty members gas-lighting other faculty, some faculty members using abusive language, yelling profanities and making snide comments in faculty meetings. I have seen attempts to undermine others in the form of rumors, half-truths, and baseless claims. 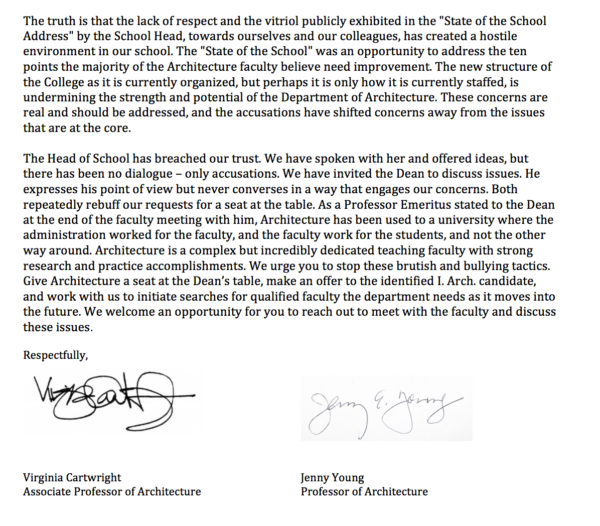 Again, this kind of behavior has NO PLACE in the School of Architecture and Environment. Regardless of what the argument is, what the conversation is, this behavior – this bullying – has NO PLACE in a professional environment. Period. This speech was delivered to the architecture faculty – or those who stayed to hear it all – with Dean Linder watching from the back. 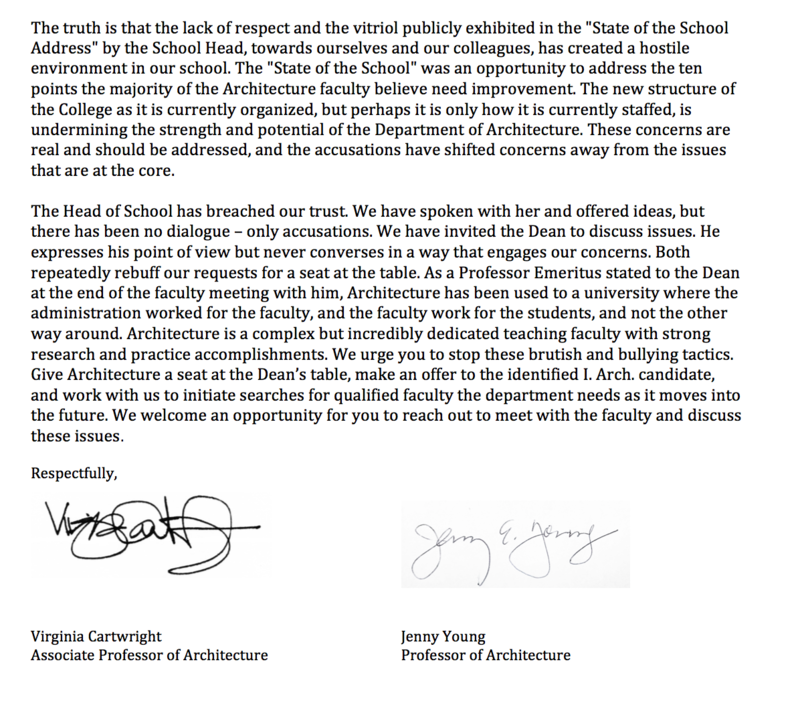 Finally, I would be remiss if I did not express my disappointment in the tenor of this conversation and the actions of some that have led multiple faculty members to express fears of retaliation and describe a hostile environment and bullying by their faculty colleagues. Such behavior – intended or unintended – is not welcome at the University of Oregon. It too must end. Shortly thereafter Provost Banavar told the Department of Interior Architecture that he refused to approve the hiring of their top choice for a previously approved search. The second, longer letter is under revision as signatures are collected. It will be posted when available. The Head of School spoke, the Dean of the CoD did not. That’s most of what I know, except for the fact that their new website makes it pretty damn hard to find a list of the faculty. Their web-designer should try https://xkcd.com/773/. Six months after the launch of the College of Design, some faculty members are complaining about a new level of bureaucracy and the fate of some of the old programs. Also, some faculty members are unhappy over a controversial court decision that allows dean Christoph Lindner to control extra funds from a donor’s will that were intended only for books and photographs for the art history department. 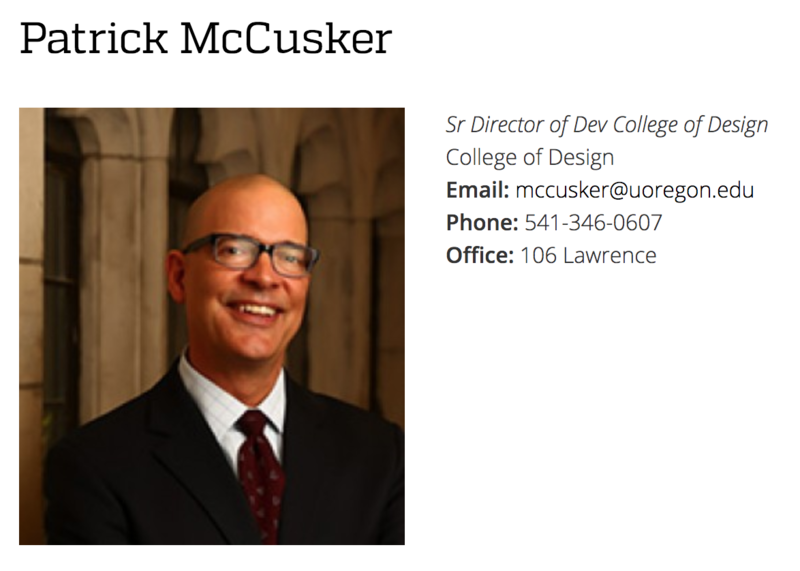 Lindner, who became the dean of the School of Architecture and Allied Arts in 2016, proposed that the school undergo a massive restructure and become what is now known as the College of Design. Established in fall 2017, the college is home to these schools: Architecture and Environment; Art and Design and Planning, Public Policy, and Management, as well as one department: the History of Art and Architecture. The rest of the story goes into the details, including a faculty / union meeting. That’s the rumor. Apparently they want their own autonomous school of architecture. The Faculty Club opens Wednesday at 5PM.